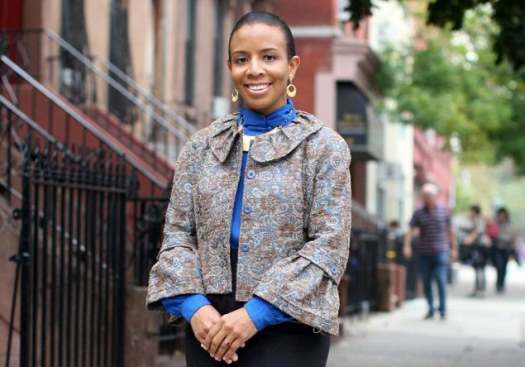 In her statement, Cumbo addressed the outrage expressed by fellow government officials and members of the Jewish community when she said that the violence could stem from race relations between blacks and Jews in the Crown Heights area, specifically that various black residents said they feel threatened by the growth of the Jewish community. On November 5th, the voters in the 35th Council District conferred upon me the highest honor of representing them in the New York City Council. From the outset of my campaign, I have sought to be sensitive to the needs of all the residents in the District, regardless of their ethnicity, race or faith. I am proud that my supporters have come from virtually every segment of the communities present in the 35th CD. In addition, during the course of the campaign I knocked on hundreds of doors and had numerous conversations with local residents, learning more of the many issues on the voters’ agendas, as well as their hopes, fears and perceptions. My top priority has always been addressing those issues that matter most to my constituents as the representative of all of the people in the District. I want to build bridges and bring people together and so I especially regret that my comments on the recent violent incidents in Crown Heights were offensive to my constituents. My intent in writing my recent letter was to stimulate dialogue on an important issue, but in doing so, I emphasized the divisions between people and repeated inappropriate stereotypes instead of bringing them together. I sincerely apologize to my Jewish constituents for any pain that I have caused by what I wrote. It was the opposite of my intention. I have taken the last week to reflect, evaluate and meet with Jewish, African American and Caribbean leaders all across New York City, and I understand now that my words did not convey what was in my heart, which is a profound desire to bring our diverse communities closer together. As I am about to embark on my career in government, my goal is to generate collaborative ventures that will bond people of all backgrounds. I hope and pray that I can achieve these goals, in the spirit of the 133rd Psalm, “How good and how pleasant it is when brothers dwell in unity”. 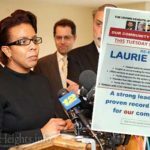 A week ago we expressed criticism towards Councilmember-elect Laurie Cumbo for her statement placing a possible motive for the recent ‘Knockout’ attacks in Crown Heights. The JFA felt her comments were inappropriate and may be misunderstood as excusing the violence. Over the past week we met with Laurie and other elected officials in the district to discuss our concerns and disapproval. The Jewish Future Alliance commends Laura Cumbo for doing the right thing and apologizing. We look forward to working together in the future as “one community”. #2: it seems that she learned from her lack of experience in this delicate area, and I hope that I will end up being able to respect and not find anything to suspect. It was a grossly obvious miscalcuation on human rights, cultures, and more. and the work goes on……so lets see how it goes. I regret that we don’t have any real leaders that would demand she resign. All these so called “leaders” only represent themselves and their own agenda/deep pockets. Dov Hikind, aka Mr. RedInTheFace is the biggest phony of them all. What this Cumbo said was not a random thought, this is what she truly believes. Her mistake was exposing what she believes. Our mistake is falling for this apologie. What do you expect from corrupt Mossrim? Let’s not forget that it was Sperlin, Hendel and the CHJCC cabal which orchestrated the blood libel against the Shomrim Six. It is the Jewish cabal that has terrorized fellow Jews for over 30 years. 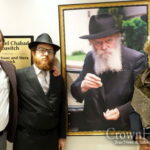 The Mossrim of Crown Heights have been more of a danger to Jews then any common criminal. And now, Mr. Yaakov Behrman (who?? Where did he pop up from? I guess he made a few bucks & now he’s an expert on all things political in Crown Heights) tells us everything’s just peachy. Well, sorry, Mr. Behrman. I admire you for your ability to rope in all the sheep who blindly do what they’re told. A hitherto unknown group of young guys suddenly know what’s best for us & the uninformed & ignorant sheep just go along with their “expert opinions.” It’s not such a feat, though, because look who you’re pulling in. Mr. Behrman. 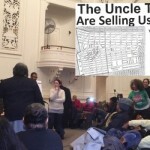 You sold Crown Heights voters a bill of goods. This woman is dangerous. She is a racist. And she is clearly stupid enough to declare her racist views. Sure, she pounded the pavement, kissed the babies & visited a sukkah or two during the campaign. Don’t we all have to do unpleasant things if we want to win the prize? But the bottom line is, she despises the Jewish community & I guarantee you will see more “gaffs” & fewer “apologies” from this hateful & full-of-hate woman. Crown Heights is stuck with her, but don’t be fooled into thinking that as penance, she will funnel money our way for different projects. Even if she does toss a bone or two in our direction, we won’t see anything, but that’s for another day. Learn from this, my friends. Learn that we need to be much more careful & to not blindly follow the special interest wannabees who “tell” us what to do. Start to think for yourselves. Stop putting your trust in FOO (Friends of Obama who visit the White House for Chanukah parties) & start looking at the issues. What was it Teddy Roosevelt said? “Speak softly, and carry a big stick.” Assume the worst, because so far, Ms. Cumbo has given us cause to do so. You make several wise points – but why the attach on Yakov Berman? Do you want respect or his job? Are you jealous of his success? You clearly, and firmly disagree with him, good for you (and I mean that) but why do you feel reputation is of no value because he disagrees with you? You are bring too much… and too angry. His visit to the White House shouldn’t be your problem back CH. You voiced your opinion really well, but lost credability with you immaturity and anger. If you are an American you’re a racist, we’ve been brought up from the beginning to think in generalizations we rarely look at individuals. Do we accept his “t’shuvah?” Is this in any way comparable to the Hungarian leader – okay, the other one is still not Jewish- who formerly was an anti-Semite until he found out that he Is jewish, and then changed. Now, many of us are chummy with him. Had his anti-Semitic sentiments, in the past, resulted in inciting anyone to kill or hurt Yidden, would we still accept him? Sharpton is as phony as a three dollar bill. He is deeply anti-Semitic; witness his “Diamond Merchants” comments during 1991 pogrom. When the KKK burn a cross on her front yard, she should understand that it is caused by how African-American act and therefore cross burning is acceptable. It seems you know nothing or the history about the KKK. Just “my intent in writing my recent letter was to stimulate dialogue on an important issue…”, so start talking! if it was the other way around sharpton would have been here with his posse and would have gotten the person fired pronto!!! watch your backs yidden this is not going to be the last of it……. Let’s be honest – her carrier won’t repair from this. She’s done colossal damage to herself. I don’t care that she made a “mistake” I actually like comeback stories. She is in fact a racist and unfit for office. My name is spelled “Yaacov” with a C. Talk about me as much as you want but spell my name right. Comment 3 provides no evidence to back up his allegations of endorsement for personal interests. He provides no documents or quotes that even indicate that I told people who to vote for in the city council race. Comment 3 is hiding out in Long Island commenting on Crown Height issues. He is embarrassed to use his real name. It’s a good thing I recognize his writing styles. My apologies for misspelling your name. Should I ever have to refer to you again I shall be sure to use a “C” in future. I hate to break it to you, but I don’t live on Long Island. I live in Crown Heights. I know to whom you refer & it amuses me that people often mistake his writing for mine and vice versa! Are you now refuting your own “influence”? Once the going gets tough, the “tough” get going? Aren’t you a key player in a group that is politically active? I seem to recall a recent trip to the White House, & pictures of you looking very involved at campaign stops for a number of candidates in the recent elections. How can you say you don’t push certain agendas? Or is it that once an ordinary neighbor takes you to task (didn’t you “accept” her [Cumbo] “apology” & were “working on it”?) you back off? Are you now saying, it wasn’t me, honest!! And now, suddenly, you have no influence. Really. Talk about avoiding responsibility. You are headed for a glittering political career, you seem to have the most valuable character trait needed: that of dodging hard questions & ducking from accountability. I don’t think you should be too complacent, though. While many of your followers hang on every word, there are some (hopefully, a growing number) who recognize political expediency & avoidance when we see it. You & your group (you are the spokesman) made a grave error. Own it. Everyone makes errors of judgment & it is a mark of great character to say one was wrong in once believing in someone who turns out to be bad for the community. The shame is in perpetuating they myth that things will be better, because they won’t. This woman has made her real feelings towards Jews very clear & I don’t think many people are so naive to think this particular leopard will change her spots. Ms. Cumbo has become the quintessential politician. Make sure you don’t offend anyone who may vote for you, say one thing and do something else. Her record will pan out her true sentiments. This woman is clearly uneducated and still does not really understand what was “so bad” abut her statements. Furthermore, she is in the dark about what is actually needed to stand up and face the real challenges in Crown Heights that cause the “knockout game.” Wanting dialogue is not even close to enough of what it will take to actually do the job she was voted in for. She should resign, and we should demand it. Let someone who is capable do the job. Furthermore, Yaakov Behrman, I don’t know you, and do not fully understand why you got involved in this, but I do not agree with your stance at all. There is nothing to work with here. 1. Condemn these attacks for what they truly are – baseless violence and cruelty by Blacks against Jews, without any excuse, rationale or linkage. 2. Prove that “Jewish money” is not an issue by actually bringing in “money” to help the “Jewish” community of CH. I would love to say: “And have the CHJCC monitor, account and publish the funds that have been received through her efforts” – but we all know that the CHJCC is corrupt, and has NEVER given us an accounting of funds received or how they are spent!